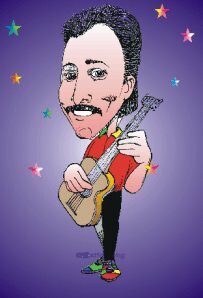 My kids enjoyed the children's music act Wayne from Maine this weekend at the Regent Theatre in Arlington, in walking distance from our house. The show is a bit cheesy, from a dad's perspective, but I suppose I am not the target audience. The kids called it the best show they ever saw, which is a pronouncement they make about any tolerable performer. Along with the silly stuff about the moose that got loose in Moosechusetts, Wayne has a program for children about nutrition. Here is a clip of the song about vegetables. Eight U.S. companies, including giant DuPont Co., agreed yesterday to virtually eliminate a harmful chemical used to make Teflon from all consumer products coated with the ubiquitous nonstick material. Although the chemical would still be used to manufacture Teflon and similar products, processes will be developed to ensure that perfluorooctanoic acid (PFOA) would not be released into the environment from finished products or manufacturing plants. See also the coverage from treehugger and the Environmental Working Group. Thanks to Jack at Fork & Bottle for the links. 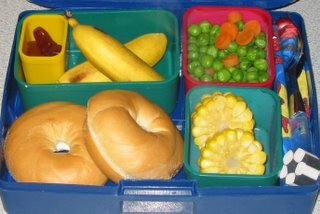 The Massachusetts House of Representatives will vote soon on a bill to promote child nutrition by restricting soda and junk food in schools (see earlier coverage here). 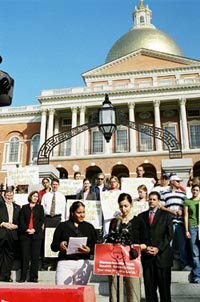 According to the Massachusetts Public Health Association, industry lobbyists are making the rounds encouraging state legislators to weaken the bill (H. 4452). The association provides a fact sheet (.pdf) about the bill and a useful link if you want to contact your representative and express a view on the bill, and on whether the bill should be weakened. Parents working with the Center for Science in the Public Interest (CSPI) announced earlier this month that they intend to sue Viacom and Kellogg under consumer protection laws here in Massachusetts. You can imagine the reaction from conservatives and libertarians. Lawsuits are no reasonable person's favorite vehicle for progress in this area, and yet just about every other door for real protection for our children, in the midst of a childhood obesity epidemic, has been slammed shut. There is some indication that CSPI would prefer negotiation with the food companies to following through on the litigation -- my impression, notwithstanding the vitriol from their critics on the right, is that the organization seems to be willing to be pragmatic if pragmatism offers hope for anything but endless delay (that story comes by way of the promising new Growers and Grocers weblog on the new Well Fed Network). 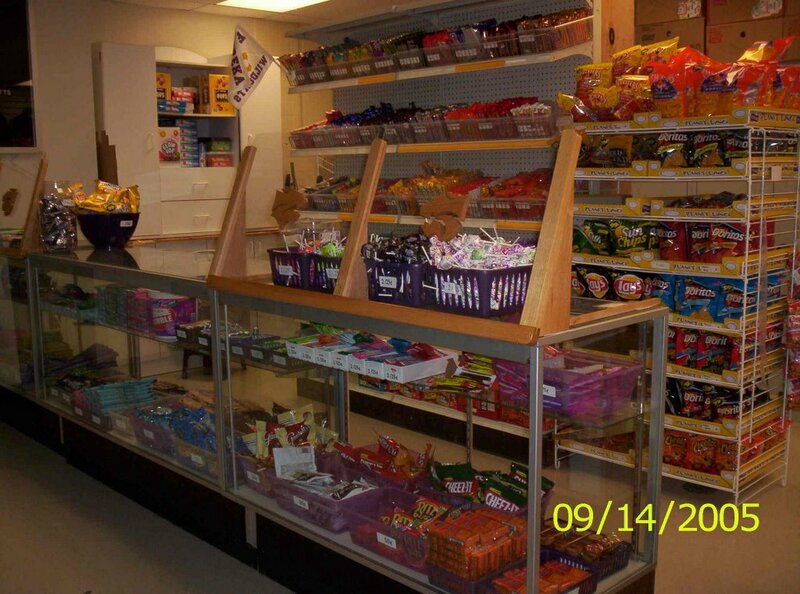 The Institute of Medicine, eminent scientific advisor to the federal government, shares the plaintiffs' high level of concern about junk food marketing to children. The Institute of Medicine proposes voluntary industry action to convert junk food advertising to healthy food advertising, but if such a change is not forthcoming, the IOM calls for Congressional action to accomplish this goal. For a response to frequently asked questions about such lawsuits, and rebuttal to some of the objections you may be considering, take a visit to the website of the Center for a Commercial Free Childhood. [Thanks to Chris of the weblog My Quiet Life for some of the links]. Breaking news. Japan is halting imports of U.S. beef after a shipment from the United States was found to contain cow parts that are prohibited in Japan as part of that country's efforts to protect consumers against mad cow disease. Agriculture Department officials scrambled Friday to repair a delicate beef-trading relationship after Japan discovered a shipment containing bone that Asian countries consider at risk for mad cow disease. Hours after Japan halted American beef imports, Agriculture Secretary Mike Johanns dispatched inspectors to Japan and sent extra inspectors to plants that sell meat to Japan. He also ordered unannounced inspections. The government barred Brooklyn-based Atlantic Veal & Lamb, the plant that sent the shipment, from selling meat to Japan. Johanns said he would take action against the department inspector who cleared the shipment. The inspector should have noticed the problem on plant documents, Johanns said. "This just simply should not have happened," Johanns said during a news conference at department headquarters in Washington. According to Johanns and some U.S. beef industry officials, the exported beef parts -- including part of a vertebral column -- are legal in the United States but not in Japan. Other beef industry folks, with the organization R-Calf, point out that there might be advantages to having U.S. food safety rules that are as strong as those in other industrialized countries. United Stockgrowers of America Chief Executive Bill Bullard said of Japan's action to halt imports of U.S. beef: "We are disappointed. After having the border closed for two years, it should have been clear to the industry that we needed to maintain strict enforcement" of health safety rules. "But this is not the first time we've had a lapse in enforcement of BSE rules. In August, we had a failure when an over 30-month animal from Canada came into this country. This validates the concerns R-CALF has raised in its litigation that we need stricter measures to maintain the highest level of consumer confidence, both domestic and abroad," Bullard said Friday on the sidelines of the group's conference in Denver. USDA's Inspector General reported this week (.pdf) that the federal agency responsible for ensuring fair competition in the meat packing industry is failing to enforce federal law. The agency, which is supposed to investigate anti-competitive practices, could not effectively define and track its investigations, plan complex investigations, or make agency policy. As a result, the Inspector General said, the agency's tracking system "could not be relied upon, competition and complex investigations were not being performed, and timely action was not being taken on issues that impact day-to-day activities." Investigative reports have been pointing out similar shortcomings for many years. A 2000 report (.pdf) from the Government Accountability Office (GAO) provides some helpful background on the role of the Grain Inspection Packers & Stockyards Administration (GIPSA). Under the Packers and Stockyards Act, GIPSA is responsible for providing financial protection for participants in livestock transactions and halting unfair and anticompetitive practices. GIPSA addresses its financial and trade practice responsibilities by regulating livestock buyers’ business practices to ensure, among other things, that sellers are paid promptly for their animals and that the animals are weighed accurately. GIPSA addresses concerns about competition by investigating complaints and concerns about anticompetitive activities4 and by analyzing data on the structure and operations of the livestock, poultry, and meatpacking industries. Overall, these functions of GIPSA are referred to as its Packers and Stockyards Programs. This week's new report from USDA's Inspector General paints a devastating portrait of agency management unable or unwilling to make key decisions, which were essential for agency staff to work effectively. “I had no idea it was as bad as it is,” said [Senator Tom] Harkin Thursday. Further, according to Harkin, the report alleges that top GIPSA officials have actively blocked efforts to enforce it. Harkin says the Senate Ag Committee should compel current and former high-ranking GIPSA officials to testify, although he concedes he can't make that happen on his own. Sensible economists, who want markets to serve consumers well with a minimum of government intervention, generally want consumers to be well informed. The idea is that if food sellers have information about product characteristics and quality, but consumers do not, then there may be a market failure. On the other hand, when consumers know what producers know, the free market works marvelously to protect the public interest. With well informed consumers, the most desirable products reap the ultimate beneficial incentive -- high sales and high profits. The controversy over labeling food from Genetically Modified Organisms (GMOs) is a good place to find out what the U.S. food industry really thinks about free markets and the public interest. 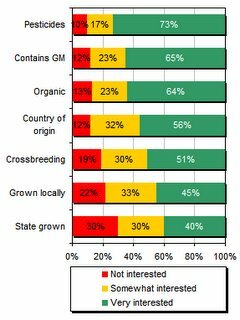 It is not just that the industry has opposed mandatory labeling of GMO products in the United States (such labeling is the rule in Europe). Astonishingly, the industry doesn't even want producers who forego GMO technology to label their products with this fact. Currently, federal rules forbid producers from using a GMO-free label if the purpose is to claim that the product is superior, which is of course the point of such a label. For a good balanced summary of the issue (indeed, I must confess, more balanced than I have the equanimity to muster for this post), see the article by William Hallman and Helen Aquino in the most recent issue of Choices. The argument for the current policy is that GMO food products are essentially the same as non-GMO products, and hence it would be misleading to allow GMO/non-GMO labeling and certainly misdirected to require such labeling. For me, the most compelling part of the article was the account of whether consumers want GMO labeling. I really don't believe that consumers are too stupid to decide for themselves, and I certainly can't tolerate the hypocrisy of paternalism disguised as consumer protection when it comes from the pro-GMO forces in the U.S. food industry. After reading the chart below, I say give the sovereign consumers what they want. US GOVERNMENT: Uh. Hello. If I could have your attention for a moment. CALIFORNIA AVOCADO GROWERS ASSOCIATION:(interrupting)*cough* Except Avocados.*cough*. MEXICO: What did you say California? The Avocado growers stand up and walk to the US Government. In their hand is clearly seen a roll of MONEY. CALIFORNIA AVOCADO GROWERS ASSOCIATION:(to the US Government) I said...Except Avocados. They aren't part of NAFTA. They have... (placing money in to US Governments hands) ...fruit flies. MEXICO: Our avocados do not have fruit flies! US GOVERNMENT:(counting money) Except for avocados. Mexico can't bring them into the US, because they have fruit flies, french fries, something. Whatever. They ain't coming in. MEXICO: We do NOT HAVE fruit flies! California gives the US Government the thumbs up and walks back to their chair to sit. The way we choose to support our U.S. food and agriculture sector is more than a federal budgetary process. The Farm Bill is a visionary document that represents our commitment to ensuring the ability of producers and consumers to enjoy abundant foods and vibrant landscapes for years to come. As young people just entering the field of food and agriculture policy, we have hope that the next Farm Bill will reflect the ideas presented here of a just and sustainable food system. Horowitz and Witteman are graduate students at the Friedman School, Tufts University, and took my class in U.S. Food Policy this past Fall. The voting period for the friendly annual awards program for food weblogs, hosted by Accidental Hedonist, is now underway. You may vote until January 18. The best thing about the awards program is the wide list of interesting food-related weblogs on the finalist's page, conveniently sorted according to their respective strengths. I have long read Fast Food News. The Food Whore has very funny writing. News You Can Eat is a good source for food industry and new product information. Saute Wednesday includes a nicely selected aggregation of food news, plus San Francisco - based editor Bruce Cole's own reviews and commentary. The folks at Accidental Hedonist also have a hand in starting the ambitious new Well Fed Network, essentially an interlinked family of food weblogs. Several people whose weblogs have long been in our sidebar appear to be contributors. Take a look! Here is an interesting session on obesity policy around the world in Boston this coming Friday, Jan. 6, at the main annual meetings for researchers in economics and related disciplines (see Allied Social Sciences Association). 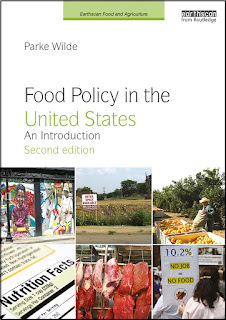 The session is organized by researchers at the International Food Policy Research Institute (IFPRI) and sponsored by the American Agricultural Economics Association (AAEA). I will be the discussant for these papers on Friday. Poor customer service by an understaffed state agency is hindering efforts by Massachusetts to improve its food stamp participation rate, which is the lowest in the nation. The Massachusetts Department of Transitional Assistance, which administers the federally funded food stamp program, is both understaffed and zealous in its verification procedures, a combination that advocates for the needy say looks lean and mean on paper and can be daunting for a food stamp applicant who is typically poor and in crisis. The most recent national data indicate only about 43 percent of the people who qualify for food stamps in Massachusetts receive them. Nudging the rate up to 66 percent would bring in at least $80 million more in federal support. This year's report, the third of its kind, reveals high levels of hunger in our state, especially in low-income communities. According to the Status Report, in low-income neighborhoods one child in three lives in a family unable to meet its basic need for food. This rate of hunger is four times the statewide average. Project Bread works especially hard to serve these communities.